” Our performance in the Cathedral of Christ the Saviour was a political gesture, which concerns the problem of merging of Russian Orthodox Church (ROC) and the Putin government. Patriarch Kirill has repeatedly spoken about of clearly not the holy figure of Putin and urged his parishioners not to participate in protest rallies. A political action carried out by the authorities and the Orthodox Church before the elections to the Duma, called “Wait two days to the belt of the Virgin” was aimed at creating a picture of apolitical Orthodox citizens. We are outraged with that no less than with the violation of the elections to the Duma. Therefore, we have introduced an new element in our performance – a prayer – and called our performance punk public prayer “Virgin Mary, Drive Putin Away.” Here, we return the political activity of the faithful, overcoming attempts of “Gundai” patriarch who speaks on behalf of all believers, to distort the situation. Also, we needed to sing it at the altar, and not on the street in front of the temple, that is, in a place where women’s entrance is strictly forbidden. The fact that the ROC is promoting very conservative values, which do not fit into such concepts as freedom of choice and the formation of political, gender and sexual identity, critical thinking, multiculturalism, attention to contemporary culture. We think the Orthodox Church does not currently have enough of all the above phenomena. With regard to the consequences, we were surprised by the fury and the scale of smear-campaign and capturing the women based on unverified data that hit the net. The number of threats, written by these people is off scale. We believe that as part of the post-election campaign, Mr Putin, who received the “victory” in elections, has decided to recall all the wrongs that were inflicted to him by the opposition of citizens. Most likely, this is strongly influenced by our performance on the Red Square with the song “Putin zassal.” And our performance at the Cathedral of Christ the Saviour was a formal occasion in the institution of criminal proceedings. Now the authorities do not hide and try to push another charge against the suspects – “Extremism”, because of our chorus, beginning with the words “revolt in Russia.” We are outraged by the fact that people in opposition circles are caught on the street and now held in custody. Girls do not recognize themselves as members of our group. As far as we know, they went on hunger strike, which lasted for twelve days” . es war ein turbulentes, ein sehr aktives jahr für eure lieblings wagentruppe. dementsprechend auch ein sehr teures. wie viele von euch wahrscheinlich ja eh wissen, kann aktivismus auch manchmal gewisse kosten mit sich tragen. aus diesem grund laden wir euch ein für einen guten zweck mit uns zu feiern. 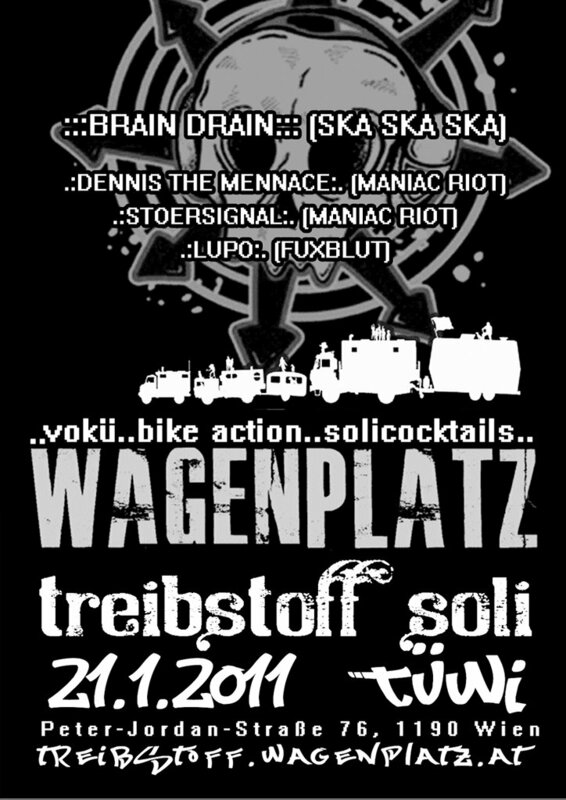 unterstützt werden wir von brain drain, einer ska band aus wien sowie dem maniacRiot soundsystem und lupo von fuxblut.